Create a piece of music that is simultaneously in 3/4, 2/4, and 7/4 time. Deadline: This project’s deadline is 11:59pm (that is, just before midnight) wherever you are on Monday, April 9, 2018. This project was posted in the morning, California time, on Thursday, April 5, 2018. Tracks will be added to “>the playlist for the duration of the project. Step 1: This week’s Disquiet Junto project, the 327th consecutive weekly Junto project, running since January 2012, will engage with the number 327. Compose a piece of music with three separate and distinct through-lines. Think of each of the three lines as an individual voice. The important thing is that the three through-lines occur in your composition simultaneously. One voice should be in 3/4 time. One should be in 2/4 time. And one should be in 7/4 time. Major thanks to Ethan Hein and Nate Trier for helping develop the project. 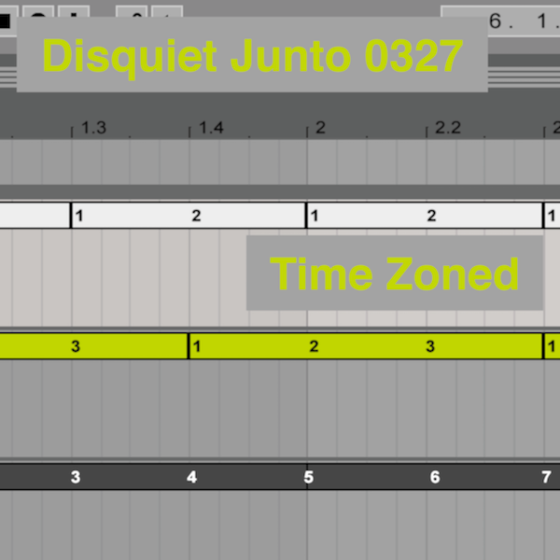 Step 1: Include “disquiet0327” (no spaces or quotation marks) in the name of your track. Step 2: If your audio-hosting platform allows for tags, be sure to also include the project tag “disquiet0327” (no spaces or quotation marks). If you’re posting on SoundCloud in particular, this is essential to subsequent location of tracks for the creation a project playlist. Length: The length is up to you. Making it 3:27 would be perfect. Title/Tag: When posting your track, please include “disquiet0327” in the title of the track, and where applicable (on SoundCloud, for example) as a tag. The image associated with this project was made by Nate Trier for the project.